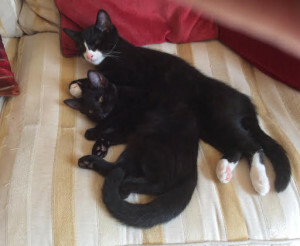 It is a month today since we adopted Timmy (Oscar) and Luna (Olivia), and we are delighted with them. They are thriving and have completely taken over our lives. We are so pleased that we have them. You will see how relaxed they are from the photo! Many thanks for giving them such a good start.